Like a lot of people, we were looking for an alternative that was lower in sugar than a juice or regular soft drink and yet all natural with no artificial ingredients, preservatives or added sugar; and that didn’t make use of intense sweeteners. We know lots of people are looking for the same thing. We couldn’t find anything, which is why, inspired by Sir Isaac Newton and his legendary association with apple, we developed Newton’s appl fizzics. 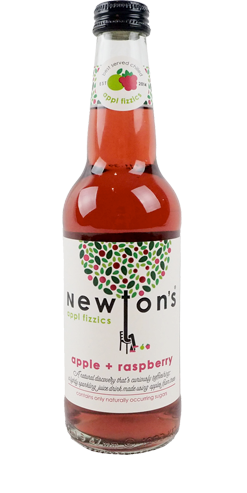 So at Newton’s appl fizzics, we have decided that all our products will always be completely natural, without anything artificial in them at all and with no added sugar. We know that you want them to be lower in sugar than regular juice of soft drinks. And we want them to be healthier as well. 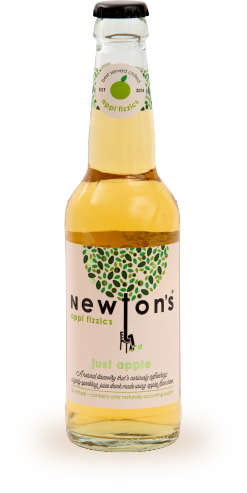 Because Newton’s appl fizzics contains sparkling water as well as apple juice, it tastes really, really refreshing. It also means it contains about 40% less sugar than juice on its own. Unlike some other juice-based products, we don’t add sugar. We just let the crisp, fresh taste of apple speak for itself. This is why we call it curiously refreshing. 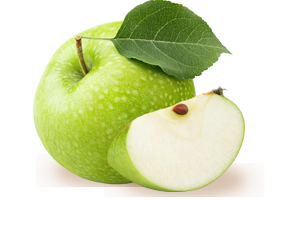 Our first product is ‘just apple’. It’s a blend of apple juice and sparkling water. We will let you know as soon as we are ready to bring you our first additional flavour. 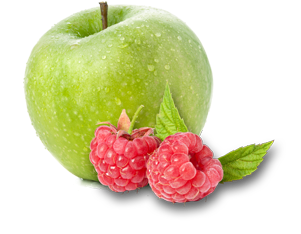 Our first new product is apple + raspberry, which is already proving extremely popular. It is a blend of apple juice and raspberry juice, with sparkling water and natural flavour. No added sugar or sweeteners. It comes in our lovely 750ml glass bottle (like a wine bottle), which is ideal for sharing or for the Dinner table; and our handy 330ml bottle which contains one generous serving. © 2019 Newton's Appl Fizzics.